It’s no secret that customer service employees have to deal with angry customers nearly about 80% of the time. In this digital age only a few people will call your support to inquire about a product or service when most of the answers can be easily found online. Nearly 70% of customers quit doing business with an organization because they felt they were treated rudely or with indifference. 95% of customers share bad experiences with others, 54% share bad experiences with 5+ people, 45% share negative reviews on social media. 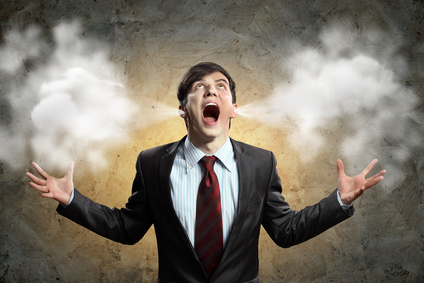 66% of customers are most frustrated from interacting with employees who are rude or unfriendly. ‘The customer is always right’ – you probably heard it a thousand times. Even though in reality it’s not always true, trying to convince customers they’re wrong will never make them happy and will never help you win their loyalty. Instead, focus on the facts, use the word ‘miscommunication’ that suggests someone conveyed things one way, and someone understood them another way, and then offer alternatives. Asking a customer why something was or wasn’t done would only make them start looking for excuses. If you need to gather more information for solving the problem, use more questions like ‘what’, ‘where’, ‘when’, ‘how’ and ‘who’. Avoid asking ‘why’ questions, especially when confronting a customer who’s angry or upset. This is what can make a customer hit the roof, and you definitely don’t want that. Frustrated customers may really need to calm down but telling them to do so will only make things worse. It signals that the problem they are dealing with isn’t as important to you as it is to them. Instead, let the customer vent their frustration while showing empathy, patience and understanding. Interrupting an angry and frustrated customer is one of the worst things a customer service agent can do. In fact, sometimes all a customer wants is to know there is an emphatic listener on the other side and to feel they are really being listened to. Let them speak out and only then respond while keeping your cool and remaining polite and professional no matter what. It doesn’t matter if a customer’s problem seems minor in your eyes. It may not be a big deal to you, but if a customer finds it serious enough to take the effort and bring something to your attention – it is a big deal to them. Saying something like “It’s not so bad” will only downplay the customer’s problem and make them feel unimportant. Although being honest is definitely important in building trust with customers, there are other ways to admit your ignorance: “I’m not sure, but I’ll be happy to find out for you”, “That is a good question, let me check with our team and update you further”, “I’m sorry, this question would be out of my expertise, but I will clarify this with our tech department and get back to you shortly” – are far better options. When you can’t provide what your customer is asking for, always give an explanation why you can’t do it: “It wouldn’t be possible for us to do, because…” Then, focus on what you can do: “Sorry to hear that, but here’s what we can do for you…” If you really don’t do something just because you don’t, suggest the best alternative, even if that would mean sending a customer to your competitor. Policies keep companies running smoothly but when customers complain, the last thing they want to hear are your standard procedures and regulations. In fact, they are not interested in your policy at all, what they are interested in is how their situation can be quickly resolved to their satisfaction. Instead of hiding behind the word ‘policy’, give them a simple logical explanation why it exists and suggest what can be done to resolve the issue. In an age when most consumers make their purchasing decisions based on what others have to say, no brand wants to receive negative reviews. However, asking a customer NOT to leave a bad review is NOT the best idea. If a customer feels you’re more concerned with what other people might think than genuinely helping them, you can be assured that a bad review is going to happen. Are you guilty of telling your customers some of the listed above? What other dangerous words and phrases should be avoided at all costs by front-line employees when interacting with angry customers? Feel free to share your experience with our blog readers! This entry was posted in Articles, Best Practice, Tips and Tricks and tagged angry customers, contact center, customer service, customer service etiquette, customer service mistakes, customer service training. Bookmark the permalink. This is an excellent list. The challenge for some customer service professionals is figuring out what to say instead! A good replacement should feel like you are working with the customer, not against them. It’s a good exercise to gather the team together and brainstorm a few replacements to true. Thank you Jeff, glad you enjoyed it! Very sound and ample advice. These tips are not only good for customer service representatives but also for real life situations. Being aware of these things can really help out in the long run since it gives you a better eye on what you can do to the situation and lead you to the right decision. Thanks for sharing! Thank you Henry, glad it was helpful!